For today’s test we have a Mitsubishi Lancer Evolution X. Compared to the SST model this 5-Speed manual model is relatively easy to tune since the SST software is quiet tricky to get along with. 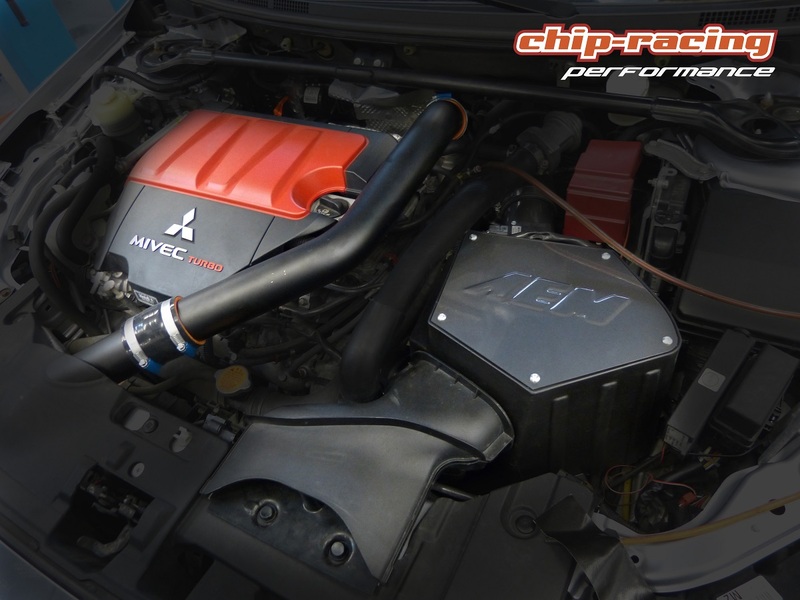 The Evo’s potential is not a secret, but what can some simple bolt-on’s and software do to your Evo X? 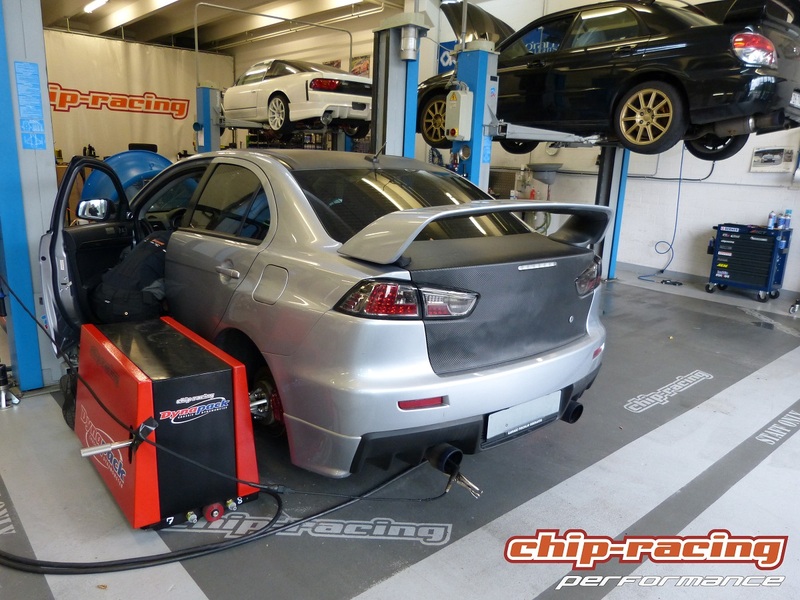 As usual we strapped the Evo X onto our Dynapack Dyno to get a baseline to see how much the gains are compared to stock! At this point the Invidia Exhaust was already installed by our customer. After installing the ETS intercooler kit and AEM intake we noticed the same effect that we talked about in our Subaru Bolt-on test. Thanks to the exhaust the backpressure drops, the turbo spools earlier and produces more boost, supported by the intake which makes breathing a whole lot easier for the 4B11. The turndown however, is no surprise eighter. The boostcurve is out of range and swings it’s way up the revs. Means that the engine feels inharmonic. But not enough, it gets worse when looking at the ignition timing. Due to the higher boost the ignition timing is off, causing the engine to knock under given surcumstances. This can cause engine failure, so, better don’t mess with knocking engines and get your car mapped properly. 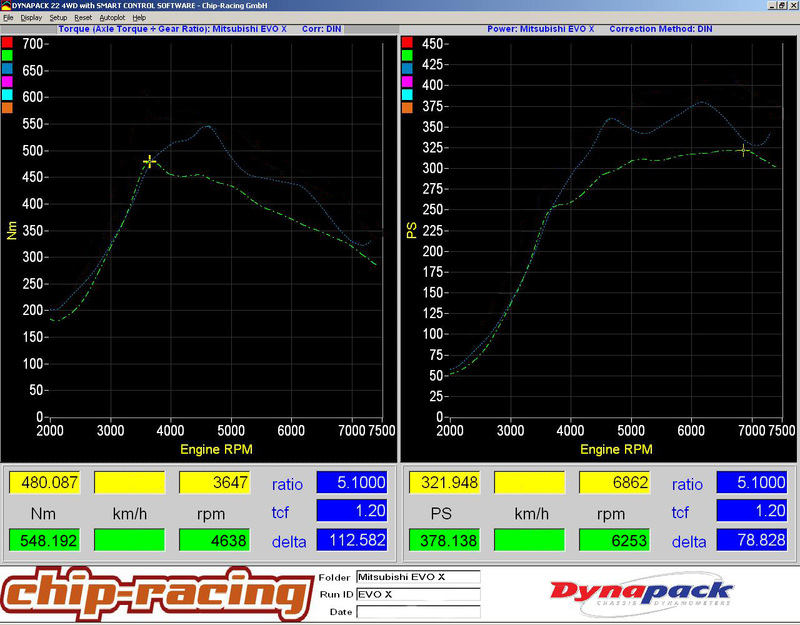 A few hours later, after the mapping, the Evo X can unleash it’s full power, without being worried about the engine! If we talk about the mapping of a Evo X at this stage, tuned with just some bolt-on’s, the remap does not create huge powergains. Evo’s always react pretty well to higher boost, which an exhaust and intake does. So, the most of the power is created by the higher boost, the mapping just makes sure that the engine is running healthy, with the Air/Fuel ratio and ignition set properly, plus refines the torque and powercurve. If we compare the two curves we can see how much better the driveability is and how huge the power difference at several RPM’s is. Peak power isn’t that much more, but it makes a big difference when we look at the whole powerband!